What’s with the Double Standard on Right-Sizing a Road? Over the past several weeks, there has been an avalanche of letters attacking the City proposal to right-size Folsom. Hundreds of opponents filled the Council auditorium to denounce the idea at multiple meetings. The complaints have been repetitive: There are no metrics telling us whether the projects have succeeded or not! Not enough involvement by stakeholders such as businesses and neighborhoods! Not enough public involvement! No studies showing whether they will work! It will cause terrible congestion and air pollution! No before and after studies! Pro-bike bias! Waste of a huge amount of money! First of all, citizens should know that City staff has done many studies and public meetings that are alleged to be lacking. Far more than most other transportation projects conducted in the past. Second and much more importantly, I am utterly shocked by the double standard here. I have been working professionally and academically in transportation for over 30 years, and I have never seen this level of enraged opposition, calls for studies, and requests for more public input. One would think that the City was proposing to bring about the end of the world. 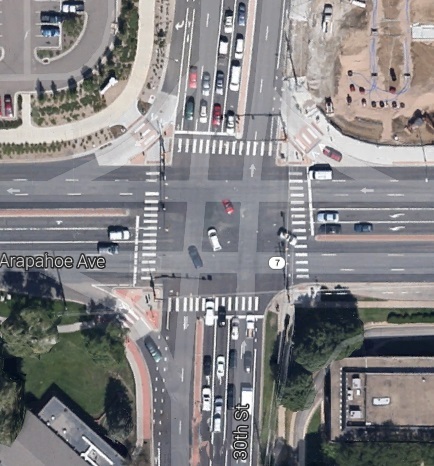 The double standard is that I don’t recall ANY opposition when the City has proposed to install a second left-turn lane at an intersection (which has been done several times in Boulder), among many other pro-car projects. No calls for studies. No demands that stakeholders be involved. No metrics telling us if the double-left had the intended benefits a year later. No before and after studies. No cries that it will increase air pollution or car dependence. No demands that the double-left turn be tested first before it is made permanent. No whining that the double-left turn is a big waste of money (for the record, double-left turns cost a lot more money, generally, than right-sizing). Few people, if any, attend meetings to oppose such an enormous expansion of an intersection. I would think that the outcry from a proposed double-left would be furious. After all, double-left turns increase air pollution, car trips, local taxes, regional car trips, car crashes, speeding, inattentiveness, injuries and deaths. They reduce walking trips, biking trips, and transit trips (because the intersection is now much more dangerous to walk through or bicycle through). They are toxic to businesses and homes near the intersection. By striking contrast, national studies show that right-sizing reduces air pollution, speeding, inattentiveness, car trips, car crashes, injuries and deaths. They increase walking trips, biking trips, and transit trips. They improve the health of retail and residences (I understand that many businesses in Seattle now ask that their street be right-sized after they have seen their competitors benefit after their streets were right-sized). 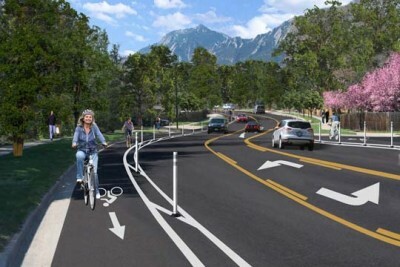 Yet in Boulder, we see furious opposition to right-sizing and hardly any objection to a proposed double-left turn. And by the way, unlike right-sizing, double-left turns are NEVER tested first to see if they will work. They are just “rammed down our throats,” as many right-sizing opponents oddly tell us about right-sizing. Making a road change that eases bicycling and walking is met with fury. Making a road change that eases driving (and discourages bicycling and walking) is met with silence. Given this, one would think that there is a very pro-CAR bias in Boulder. One also has to ask: Who needs enemies when we have ourselves? Ian Lockwood, a transportation engineer, prepared a report for West Palm Beach Florida in the 1990s that identified biases inherent in some of the transportation language commonly used today for transportation projects. The report recommended more objective language be used for all correspondences, resolutions, ordinances, plans, language at meetings, etc. and when updating past work. The following is based on that report. Background. Much of the current transportation language was developed several decades ago at a time when the car was the major priority in cities. However, an important contemporary objective for many cities is creating a balanced, equitable, and sustainable transportation system characterized by freedom of travel choice. Unfortunately, transportation language has not evolved to comply with this objective, and much of it still carries a pro-car bias. Continued use of biased language is not in keeping with the objective of a balanced, equitable, sustainable, “smart” transportation system. Language Changes. There are several biased words and phrases that are still commonly used, and which should be phased out as a way to achieve this objective. The following street improvements are recommended. The intersection improvement will cost $5,000. The motor vehicle capacity will be improved. The following street modifications are recommended. The right turn channel will cost $5,000. The motor vehicle capacity will be changed. Like “improved” and “improvement,” there are similarly biased words such as “enhance,” “enhancement,” and “deteriorate.” Suggested objective language is shown in the examples below. The level of service was enhanced. The level of service deteriorated. The capacity enhancements will cost $40,000. The level of service for cars was changed. The level of service for cars was decreased. The level of service for cars was increased. The increases to car capacity will cost $40,000. Upgrading the street will require a wider right of way. The upgrades will lengthen sight distances. Widening the street will require a wider right of way. The changes will lengthen sight distances. Promoting “alternative modes of transportation” is generally considered a good thing at the City. However, the word “alternative” begs the question “alternative to what?” The assumption is alternative to cars. “Alternative” also implies that these alternative modes are nontraditional or nonconventional, which is not (or should not be) the case with the pedestrian, bicycle, nor transit forms of travel. In addition, the term “alternative” disparagingly implies that it is a form of travel only used by undesirable, strange, or weird people, and will therefore never be a form of mainstream transportation used by us “normal” people. If we are discussing “alternative modes of transportation” in the City, direct and objective language or modifiers such as “non-automobile” or “sustainable” forms of transportation should be used. Alternative modes of transportation are important to downtown. Non-automobile forms of transportation are important to the downtown. Non-motorized forms of transportation are important to the downtown. Sustainable forms of transportation are important to the downtown. Motor vehicle accidents kill 200 people every year in the County. He had an accident with a light pole. Here is the accident report. Motor vehicle collisions kill 200 people every year in the County. He crashed into a light pole. Here is the collision report. Everyone at the City should strive to make the transportation systems operate as efficiently as possible. However, we must be careful how we use “efficient” because that word is frequently confused with the word “faster.” Typically, efficiency issues are raised when dealing with motor vehicles operating at slow speeds. The assumption is that if changes were made that increase the speeds of the motor vehicles, then “efficiency” rises. However, this assumption is highly debatable. For example, high motor vehicle speeds lead to suburban sprawl, motor vehicle dependence, and high resource use (land, metal, rubber, etc.) –which reduces efficiency. Motor vehicles use the least fuel at about 30 miles per hour, and the capacity of a street to carry cars is maximized at this modest speed; speeds above this result in inefficiencies. In urban areas, accelerating and decelerating from stopped conditions to high speeds results in inefficiencies when compared to slow and steady speeds. There are also efficiency debates about people’s travel time and other issues as well. Therefore, it is important that if the intent is “faster,” the term “faster” should be used. “Faster” is not necessarily more “efficient.” Similarly, if “slower” is meant, the term “slower” should be used. The traffic signal timings were adjusted to increase motor vehicle efficiency. Let us widen the street so that cars operate more efficiently. The traffic signal timings were adjusted to increase motor vehicle speeds. Let us widen the street so that it cars operate faster. Too often, bureaucrats use terminology in their presentations and reports that are unnecessarily confusing or hard to understand. The result is that many undesirable government actions face less public opposition because citizens are unable to understand the implications of the proposal. Many believe that this lack of using “Plain English” is a deliberate form of obfuscation, as it gives bureaucrats more power (citizens must rely on the bureaucrat to explain the communication), or protects the bureaucrat from criticism (because citizens are unaware of the implications of the proposal). In a democracy, government must be as transparent as possible, which means that communications from government must strive to use as much plain, simple language as possible. The following provides examples.